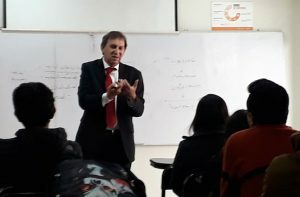 El profesor Fernando Velásquez, académico de la Universidad Arturo Prat de Chile que visitó a la UPAGU como parte de la delegación de visitantes de dicha casa superior de estudios, compartió conocimientos y experiencias sobre Capital Intelectual con los estudiantes de Administración y Negocios Internacionales del VI ciclo, en la asignatura de Dirección del Capital Humano a cargo del docente Carlos Anderson. Los estudiantes quedaron muy satisfechos con este compartir académico entre ambas Facultades de Ciencias Empresariales de la UPAGU Y la UNAP. 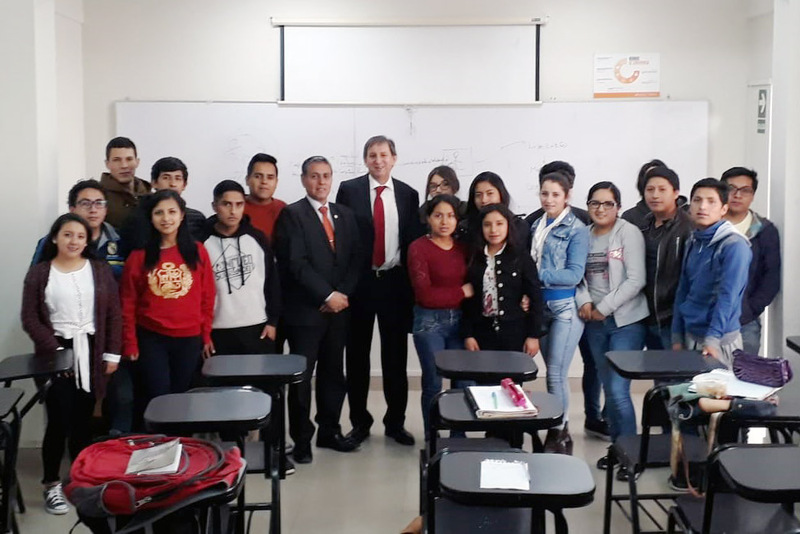 Reiteramos nuestro agradecimiento a la delegación chilena y felicitamos la gestión de la UPAGU que permite la visita constante de Universidades internacionales para potenciar las habilidades y competencias de nuestros alumnos. What i do not understood is actually how you’re now not really a lot more well-favored than you may be right now. You’re so intelligent. You recognize therefore considerably with regards to this topic, produced me personally believe it from a lot of numerous angles. Its like men and women aren’t fascinated except it’s one thing to do with Woman gaga! Your individual stuffs excellent. At all times deal with it up! I do accept as true with all the ideas you have introduced for your post. They are very convincing and will definitely work. Nonetheless, the posts are very brief for starters. May just you please extend them a little from subsequent time? Thank you for the post. Hi would you mind letting me know which web host you’re using? I’ve loaded your blog in 3 different internet browsers and I must say this blog loads a lot quicker then most. Can you suggest a good internet hosting provider at a fair price? Cheers, I appreciate it! Hello there, just was aware of your blog via Google, and located that it’s really informative. I am going to be careful for brussels. I’ll be grateful in the event you continue this in future. Numerous other people will be benefited from your writing. Cheers! I have read several excellent stuff here. Certainly value bookmarking for revisiting. I surprise how a lot attempt you put to create such a excellent informative site. Greetings! I know this is kinda off topic but I’d figured I’d ask. Would you be interested in exchanging links or maybe guest authoring a blog post or vice-versa? My site goes over a lot of the same topics as yours and I think we could greatly benefit from each other. If you are interested feel free to send me an e-mail. I look forward to hearing from you! Great blog by the way! Sweet website , super pattern, really clean and utilise genial. I was reading through some of your blog posts on this site and I believe this site is real informative ! Keep on posting. Heya i’m for the primary time here. I found this board and I to find It really useful & it helped me out a lot. I’m hoping to give something again and aid others such as you aided me. That is very fascinating, You’re an overly professional blogger. I have joined your rss feed and look ahead to seeking extra of your wonderful post. Additionally, I have shared your web site in my social networks! Hi there very cool website!! Man .. Excellent .. Amazing .. I will bookmark your web site and take the feeds additionallyKI’m glad to search out a lot of helpful information here in the put up, we need work out more techniques in this regard, thank you for sharing. . . . . . Thanks for another informative blog. The place else may I get that type of information written in such a perfect approach? I have a project that I’m simply now working on, and I’ve been at the look out for such information. Hiya very nice website!! Guy .. Beautiful .. Wonderful .. I’ll bookmark your web site and take the feeds additionally?KI’m glad to find numerous helpful info right here within the submit, we want work out extra techniques in this regard, thank you for sharing. . . . . .
I’m just commenting to make you understand what a excellent experience my daughter found reading through your site. She came to understand a good number of issues, most notably what it is like to have a marvelous helping mindset to have other people without problems grasp certain complex matters. You truly did more than visitors’ desires. I appreciate you for distributing such important, trusted, edifying and in addition easy guidance on the topic to Evelyn. Excellent website. A lot of useful information here. I am sending it to a few friends ans also sharing in delicious. And of course, thanks for your sweat! I will immediately grab your rss as I can’t to find your e-mail subscription link or e-newsletter service. Do you’ve any? Kindly let me understand in order that I may just subscribe. Thanks. Howdy I am so happy I found your weblog, I really found you by error, while I was looking on Bing for something else, Anyways I am here now and would just like to say thanks for a incredible post and a all round entertaining blog (I also love the theme/design), I don’t have time to look over it all at the minute but I have book-marked it and also added in your RSS feeds, so when I have time I will be back to read a great deal more, Please do keep up the great job. I want to convey my affection for your kindness for those people that require help on that study. Your real dedication to getting the solution along appeared to be extremely advantageous and have frequently empowered most people just like me to realize their ambitions. Your amazing helpful useful information indicates a whole lot to me and much more to my mates. Best wishes; from all of us. When I initially commented I clicked the -Notify me when new comments are added- checkbox and now every time a comment is added I get four emails with the identical comment. Is there any approach you may take away me from that service? Thanks! Greetings from Colorado! I’m bored to tears at work so I decided to check out your website on my iphone during lunch break. I love the info you present here and can’t wait to take a look when I get home. I’m shocked at how quick your blog loaded on my phone .. I’m not even using WIFI, just 3G .. Anyways, superb site! What i don’t realize is actually how you are now not actually much more neatly-liked than you might be now. You are so intelligent. You realize thus significantly relating to this subject, produced me in my opinion imagine it from numerous various angles. Its like women and men are not fascinated except it¦s something to accomplish with Girl gaga! Your personal stuffs excellent. Always care for it up! I believe this site contains some rattling wonderful information for everyone. “Dealing with network executives is like being nibbled to death by ducks.” by Eric Sevareid. Magnificent web site. Lots of useful information here. I’m sending it to a few buddies ans also sharing in delicious. And obviously, thank you for your effort! obviously like your web site but you need to check the spelling on several of your posts. Many of them are rife with spelling issues and I find it very troublesome to tell the truth nevertheless I’ll surely come back again. What¦s Happening i am new to this, I stumbled upon this I have discovered It positively useful and it has aided me out loads. I hope to give a contribution & aid other customers like its helped me. Good job. I do trust all of the concepts you’ve introduced to your post. They’re very convincing and can definitely work. Still, the posts are very quick for newbies. May just you please prolong them a bit from next time? Thanks for the post. Hi, Neat post. There is an issue along with your site in web explorer, could check this… IE still is the marketplace chief and a large component of other people will pass over your excellent writing because of this problem. hello!,I really like your writing so so much! percentage we keep in touch extra about your article on AOL? I need a specialist in this house to unravel my problem. Maybe that is you! Looking ahead to peer you.